Seven years ago I wrote a poem on here called, ‘Finding Fluorescent Grey’. It was hardly a piece that was going to see me named as the next poet laureate (poetry is really not my strength), but I’ve been thinking about the message behind it a lot lately; to the point where I wanted to try and express it in a more physical form through the scribbles above. Neither the poem nor the graphics are anything special; if anything, they would probably be the subject of ridicule by professionals (or most other people for that matter) but… they felt so good to create, and in my opinion that’s what should be the priority for any artist, be it a writer, painter or somebody on stage. I have come across many people who admit to a thirst for being creative but barely give themselves a chance to execute their ideas under the assumption that whatever they produce will be “rubbish”. The truth is that there is no such thing as rubbish art. I denigrate my poem because I have read a million better pieces and recognise that there are many areas it could be improved, but I’m still satisfied that the words are an accurate reflection of something I had an overwhelming desire to express. Likewise the graphic above required no real talent to produce but I think it represents the meaning I was trying to get at in the poem, so I’m happy. As long as you are working towards this, it’ll never be bad art. It’s different if you are being asked to produce, with paints and pens, an accurate depiction of something else. In these instances, it is somewhat more justified to judge. 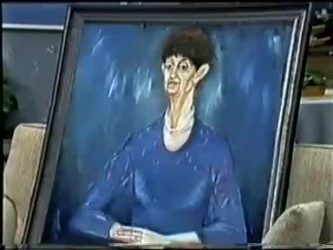 Take that legendary, less-than-flattering portrait of Mrs Mangel from Neighbours circa 1986 as an example, ha! But for everything else, there really are no rules, and I think that’s possibly why I get so much delight from maintaining this blog and uploading my crude cartoons to my Instagram account. In a life governed by routines, processes and time-slots I relish my time to crawl outside of the cage and get creative, and would encourage anybody else to do so too. It’s amazing what you can learn from it. A sweet, soft little indie-pop song that unfortunately only lasts two minutes. Really lovely listening, especially for cold Winter evenings. The retrospectively optimistic sounding, “Ah well, perhaps by the time you’re thirty, though” comfort-sentence was adapted several times over the years until it basically became something along the lines of “hopefully by the time you’re reincarnated, though”. I didn’t stay living at home with mum and dad through choice, it’s just that moving out was something that was beyond my financial reach for a very long time, especially given that I was buying on my own. And because I live in the South East of England, where even the old lady who lived in a shoe probably had to resign herself to a twenty grand deposit and a thirty seven and a half year mortgage for the benefit of cuddling up to a steel toe cap each night. Everybody knows how expensive it is to buy a place. I consider myself extremely lucky to have been able to do so, and no matter how many sacrifices I have to now make to the amount of ‘fun’ I can have in order to keep myself fed and cleansed, I am so thankful to finally be here in my very own flat, where the cupboards are full of ingredients to create copious Thai curries, and the decor is dominated by my favourite shade of yellowy-green. I have been single for an extremely long time and have never felt that bothered about it. In fact, I am generally quite apathetic about the idea of marriage and children, which is maybe why I have been single for so long. I genuinely enjoy my own company, and whilst I do, of course, also love being around friends and family, I am also a bit of a fiend for wanting regular access to personal space, and am not too ashamed to attend events alone if I want to go but nobody else is interested. I have always felt very lucky in this regard, and some of my favourite memories are ones in which I “went alone”. Because of this, I didn’t think I’d have any issue at all with loneliness when I moved into my own place. Largely, it’s been as fun as I thought. I watch whatever I want to watch. I eat whatever I want. I don’t need to explain to anybody where I’m going or what I’m doing, and the truth is that by the time I come home from work I’m often so tired that I don’t think I’d be a great conversation maker anyway. It’s nice to be able to sit in silence without worrying about radiating tired or draining energy towards others. I’m terrible at concealing my feelings, and can’t feign enthusiasm if the reality is that I feel like a dusty old over-caffeinated broomstick who drastically needs a bath and a mug of Horlicks. I hadn’t noticed any problems at all, until one day I realised how much more anxious I had been since moving. Combined with a job which whilst enjoyable also necessitates a great deal of time alone, I have been spending a lot more time in my own head and not around others, and am only just starting to pick up on the thought patterns and behaviours that this has influenced. When I’m at home alone, or driving around in the car, I overthink and ruminate about things a lot more than I used to. I see problems that probably don’t really exist anywhere else beyond within that mass of space between my ears, and then wonder if I’m being overly cynical, yet other times, I think I’m incredibly naive about a lot of people and things. And then I just get confused and don’t know what to think about what I think. As soon as I’m back around people, those anxious thoughts vanish. It’s almost like putting on a pair of spectacles that enable me to read situations more clearly (to be fair I seldom wear my prescription glasses as I just feel that they make me look like Velma from Scooby Doo). I either conclude that my thoughts were irrational, or realise that even if they were true and the world really was about to end, I could probably get over it anyway. Perspective comes flooding back and reminds me of everything that I have spent many years encouraging others not to forget through this blog and other means – that the world is much bigger than your living room, pretty much most problems are only temporary, focus only on those you care about, and that even when times are hard, Frazzles exist to make it all better again. I know all of those things and have often pride myself on being pretty emotionally aware in many regards (though this has not always been the case), but only since moving out have I really started to understand how much of an influence loneliness has on the way we feel. I haven’t always felt as strong as I thought I was. Living alone is different to traveling alone, attending a concert alone, or going for a walk alone. Living alone is having nobody who really understands or knows about everything you’re going through. You may have plenty of people you speak to about a lot of things, but there’s nobody that has understanding for absolutely everything that happens on a daily basis, nobody who just knows. If I sound as though I’m feeling sorry for myself, then please be assured that I’m not trying to. I chose this way of living and I don’t regret it. I’ll happily take a few anxious thoughts every now and then if it means be able to watch retro episodes of Bruce’s Price is Right at breakfast-time, or listening to the same song on-loop for several hours, without causing anybody else any unwarranted distress. I have always believed that the key to inner peace is knowing how to manage alone – emotionally, practically and financially – and so I see this latest challenge as nothing more than exactly that, a challenge, and a learning curve which will make me stronger. The anxious thoughts I’ve been experiencing recently may disappear as soon as I’m around other people, but I’d like to get myself into a position whereby I can work through them alone instead, from the convenience of my kitchen table rather than anywhere beyond. I’m writing this post for several reasons; not just for a bit of helpful reflection of my own situation that may resonate with others who feel or have experienced the same, but largely to be open about loneliness as something which is widely known to cause a great deal of emotional difficulty to many people. As a society, we have become so much better at understanding mental health over the years, yet still many people suffer from the likes of anxiety and other issues to which over-thinking often contributes, and don’t voice it, for whatever reason. Perhaps they are afraid of what others might think, or they just don’t know that they can talk about it. If these people are lonely – be it because they live alone or they just feel alone – then it can be even harder to trace or help. If you are feeling lonely and are finding that the internal thoughts, questions or worries are making too much noise within, then recognise that that noise is just a scream for release. Pick up your phone and either make a call or send a text to a friend or relatives to make arrangements to meet. Let the thoughts out and see how different they now look. Listen to another person’s perspective on them. You are not really that lonely, and your worries aren’t really that bad. You just needed to talk. Now this one has definitely been played on loop in my flat at least hundreds of times in recent weeks. It’s the sort of song that just makes everything seem hilarious if you have it stuck in your head. Which happens frequently. Just lately I’ve found myself having more musically-induced epiphanies than normal. What do I mean by that? I’m referring to a love of song, and the potential in which we can feel differently about things as soon as there is a little music involved. Have you ever been one of those people that procrastinates behind the computer or television for hours on end, avoiding your list of important things to do because you’re lacking in energy? Perhaps you’ve just woken up, or maybe you’ve just got in from a busy day. You’re tired, and you allow yourself to become lost in the world of sitcoms, reality t.v or website after website. I find that in moments like this there is always one thing that can instantly shift me back into life, and that is music. No matter what the weather, what the mood, what the activity… there will always be a song out there that can get you really stuck in to whatever it is you’re doing, and allow you to feel whatever you’re meant to be feeling. On my Spotify I have around a thousand songs all grouped into separate playlists, to be listened to at separate times. When I’m feeling sad, I’ll revel in the company of the soft, heartbreaking ballads in my ‘Sad Songs‘ playlist. When I’m feeling good, or in need of some inspiration, I’ll listen to my ‘Uplifting Songs’. When I fancy some exercise, I’ll put on ‘Workout Music’. ‘Old Favourites’ allows me to fondly reminisce the past, as do ‘Travelling Favourites‘; and if I just want to dance around to some good music I’ll put on my General Stuff playlist. To me, music is an outlet for emotion and by listening to it, we are expressing ourselves in subtle yet effective manner. Another thing I love about music, is the way in which it can so beautifully juxtapose whatever it is we’re looking at or thinking about, and add another dimension to it somewhat. 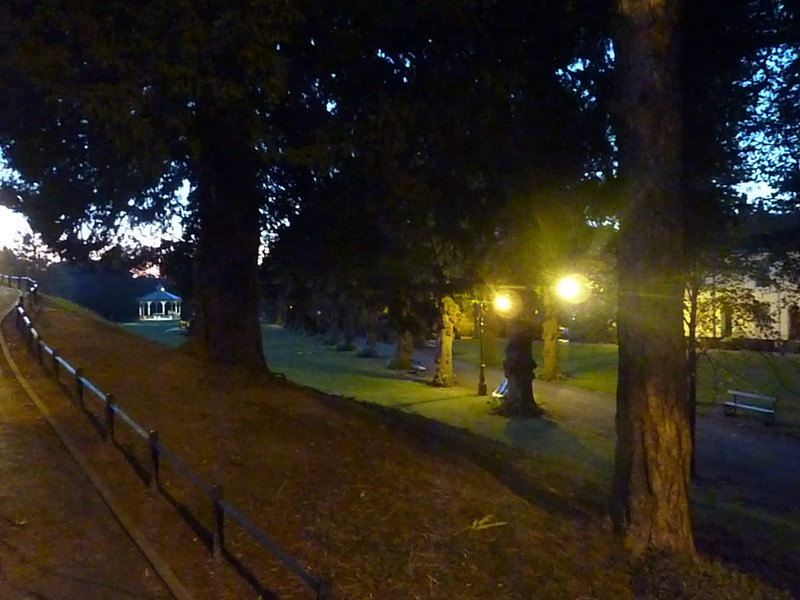 Yesterday, I was walking around the area below during twilight. It was looking beautiful and mysterious and so I took some photos to capture the images forever. In the meantime my MP3 player shuffled onto a song that I haven’t listened to in years. The lyrics and emotion of the piece seemed to make what I was looking at come to life even more. Imagination set in and it made for a wonderful moment; something that I would refer to as a ‘musical epiphany’. “Have you ever seen a sound? Have you listened to an image? Have you ever touched a thought? Have you ever tasted nothing? Have you ever told a lie that was true more than truth? When it spoke to you. It was dulling your senses, your eyes they were bound. I just love and admire how a good piece of music can add to our situations and surroundings in such an incredible way. Each time, it multiplies my appreciation of music and makes my MP3 player seem not a luxury item, but a necessity! I cannot walk alone, nor ride in a vehicle, without the company of the music to add texture and dimension to what’s around us. The journeys during which my headphones have broken or the battery has run out have seemed like something akin to torture. Long, arduous torture with nothing but the sound of an engine to enjoy. I have a tattoo of three musical notes on my lower waist (my 2-year old nephew likes to refer to it as “the drawing on your big bum”). It was my first one and as such I wanted it to have a special meaning. I opted for the notes because it represented the music which I so love and enjoy, and the guidance that it has often provided me with over the years. The way I see it, music is a direct child of passion, and in any expression of genuine passion there is the potential to find a gem of inspiration, especially within the lyrics. I think the world would be a much duller place without the existence of such a vibrant art form. As somebody who frequently bemoans the lack of originality in today’s chart music, and who recently posted an article which described the importance of not judging things too prematurely, I feel somewhat guilty that until now I have never really given Baltimore’s Animal Collective as attentive an ear as I should have done. I’ve been missing out on something magical. They’ve been doing this for a decade. This is certainly a band which will divide the music-loving population. Why? They are strange. They are experimental. They require a patience we don’t always have when we switch on our stereos and just want to have a singalong in our bedroom and release all those pent up emotions. I use a personalised internet radio station. I type in an artist I like, and it automatically selects songs by similar artists that it thinks I’ll enjoy. Animal Collective was always one of those bands that I knew I’d probably skip the song after the first 10 seconds because all it ever seemed to sound like was just a few repetitive, fuzzy and somewhat annoying noises that sounded similar to somebody operating an industrial iron in the 1980’s. However, one day I must have been a little pre-occupied, because I left the song running. I was so focused on doing something else, that I wasn’t really hearing the song anyway, until all of a sudden I found myself having no choice but to listen. The music was coming out of my computer and grabbing me by the scruff of the neck and saying, “You WILL listen to me, damnit”. It’s just… sublime. What I like about this song is that each time I listen to it, I hear a new part to it. It’s full of interesting backing noises and vocals. It makes the ‘hits’ of today’s charts seem like wallpaper music in comparison. Its just nice to see that there are artists out there who keep it unique. This is going to be an extremely short post, but it’s Saturday night and this lady has some partying to do! (Just kidding, I’m spending the weekend at home, cat-sitting whilst the parents are away. Tasks include: Feeding the cat, disposing of her diarrhoea, stroking the cat, again feeding the cat and watching The X-Factor with the cat, before saying goodnight to the cat). Despite this chaotic routine (sometimes, I don’t know how I find the time to breathe), I have now completed another of the Special Features on the site, which is the real reason behind this short post. It’s an article I wrote about the things which I have learned from living in the real world, and it’s probably too long to submit it as a normal Blog entry. Please click here to read it.